Grace to you and peace from God, our Father, through the Lord Jesus Christ. An Overview of Recovered Bible truths. 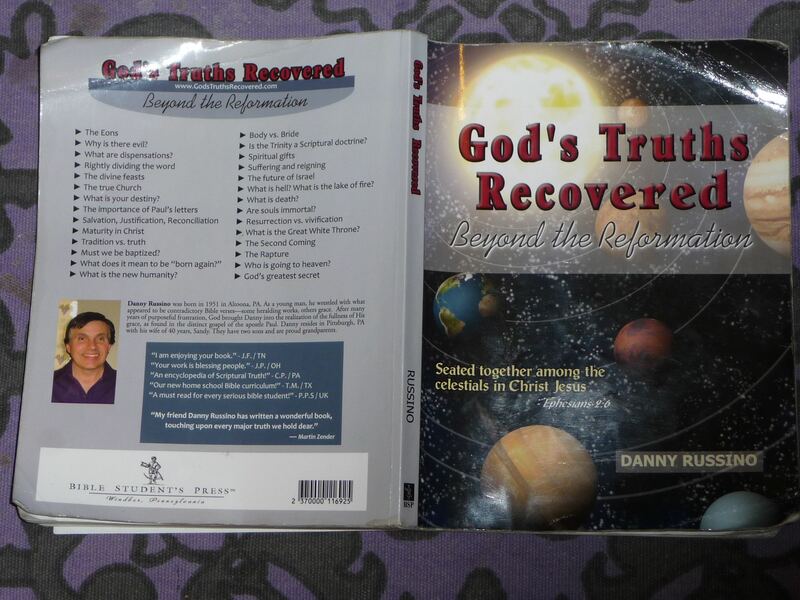 "God's Truths Recovered Beyond the Reformation"
See also tract: "What is Your Evangel?" below. 2Timothy 4:1-2 I am conjuring you in the sight of God and Christ Jesus, Who is about to be judging the living and the dead, in accord with His advent and His kingdom: Herald the word. (2) Stand by it, opportunely, inopportunely, expose, rebuke, entreat, with all patience and teaching. 2Timothy 3:10-11 Now you fully follow me in my teaching, motive, purpose, faith, patience, love, endurance,(11) persecutions, sufferings, such as occurred to me in Antioch, in Iconium, in Lystra: persecutions such as I undergo, and out of them all the Lord rescues me. Philippians 4:6-7 Do not worry about anything, but in everything, by prayer and petition, with thanksgiving, let your requests be made known toward God,(7) and the peace of God, that is superior to every frame of mind, shall be garrisoning your hearts and your apprehensions in Christ Jesus. 1Corinthians 4:11-16 Until the present hour we are hungering also and thirsting, and are naked and are buffeted and unsettled and toiling, working with our own hands. (12) Being reviled, we are blessing; being persecuted, we are bearing with it; (13) being calumniated, we are entreating. As the offscourings of the world we became, the scum of all things, hitherto. (14) Not to be abashing you am I writing these things, but as my children beloved am I admonishing you. (15) For if you should be having ten thousand escorts in Christ, but nevertheless not many fathers, for in Christ Jesus, through the evangel, I beget you. (16) I am entreating you, then, become imitators of me. These verses (above) are from Paul speaking, and he speaks only to us (Gentiles) in the books of Romans through Philemon. This is where we, the gentiles (the nations), are to obtain our instructions as to how to imitate Paul (1Corinthians 4:15,16). This is what we should be attending to, and practicing. These are our commands through Paul, from the Lord Christ Jesus. All other books are for our learning about God and His ways, only! Among the Celestials, and Blessings Among the Celestials. Note2: If you would like a tract copy, or anything else, please contact me with your request. Include, if needed: your address, your email address, phone number and request. Should it be our Lord God's will for me to comply, I will attend to your request at no cost. a) PDF Viewer (4 meg) This is a Windows program used to view PDF Files. b) FireFox Browser (40 meg) This Windows program, or perhaps any browser, can be used to read the contents of this page. c) OpenOffice (140 meg) This Windows program can be used to edit .odt files, and make PDF files. Note4: If your mouse has a wheel, the page size (letter size) can be changed by pressing the "Ctrl" key while rolling the wheel. Using keys: Ctrl "+" and "-" may also work. Note5: The Bible Program (below) requires a Windows computer. This free program contains a Greek/Hebrew Interlinear comparison and search. It also includes the English Bible translations, KJV [King James], CLV [Concordant Literal] and, YLT [Youngs Literal], for comparisons. To install this program to your Windows computer, you will need to download 3 items. You will find them at www.Scripture4All.org the creator of this wonderful Bible Study program. Visit: Concordant.org and order a New Testament Bible (CLV Version, available at Amazon.com)). 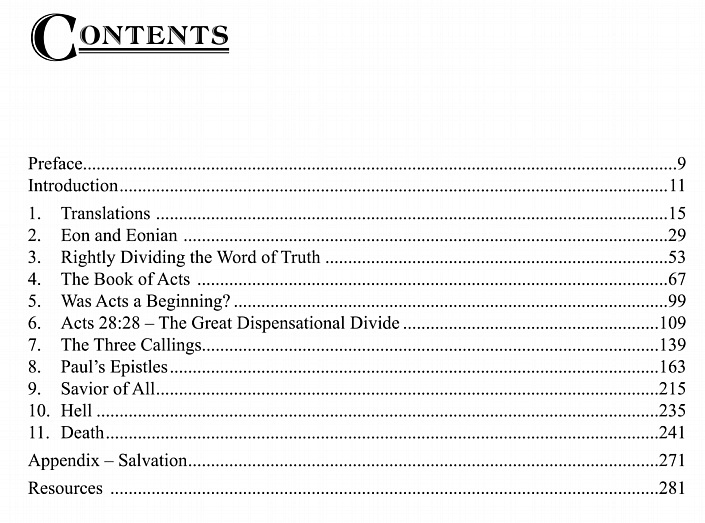 (above ^ Bible Program), which has the CLV New Testament, and Old Testament. I found a Bible Treasure: God will save all mankind (Rom 5:18) by the blood of Christ (Rev 1:5) the Firstfruit (1Cor 15:20). God will save the believers at Christ's return (1Cor 15:50-52), and lastly His enemies (1Cor 15:25). Christ, when He is the Supreme ruler, will give the kingdom to God (1Cor 15:28). The last enemy will have been death (1Cor 15:26). Once death is abolished, all the unbelievers, having been judged and cast to the lake of fire [the second death] (Rev 20:14), will be vivified and included as subjects under Christ’s feet (1Cor 15:28). Timothy 4:9-11 Faithful is the saying and worthy of all welcome (for for this are we toiling and being reproached), that we rely on the living God, Who is the Saviour of all mankind, especially of believers. These things be charging and teaching.